This article was written By John Berra on 09 Dec 2010, and is filed under Reviews. At the time of production, The Host was the most expensive film in the history of the South Korean film industry with an estimated budget of $11 million, almost half of which was raised through pre-sales to the Japanese market. Production house Chungeorahm Film was rewarded with the most successful title of all time at the local box office – prior to the economic event that was James Cameron’s Avatar (2009) – with The Host selling over 13 million tickets. This means that a quarter of the population of Korea went to see The Host during its theatrical run, although some people could have seen the film more than once. The significance of The Host within the South Korean film industry echoed the impact that Steven Spielberg’s Jaws (1975) had on Hollywood in that the opening weekend of The Host represented a saturation release; of the 1500 multiplex screens in Korea at that time, The Host played on 620. As an ‘event’ film, The Host is equally indebted to Japanese cinema, specifically the kaiju eiga genre, as it adheres to many of the ‘monster movie’ traditions established by Ishirô Honda’s Godzilla (1954), Rodan (1956) and Mothra (1961), but the social-political subtext of Bong’s film makes it more substantial than such recent genre revivals as Roland Emmerich’s Godzilla (1998), Ryûhei Kitamura’s Godzilla: Final Wars (2004) and Shim Hyung-rae’s D-War (2007). The international title of Bong’s blockbuster is The Host, but in South Korea the film is titled Gwoemul, which translates as ‘creature’ or ‘monster’. Both titles are indicative of the film’s approach to genre and social-political subtext. The original title firmly locates The Host within a specific genre and seems to refer to such classic Japanese monster movies as Godzilla (1954) or Noriaki Yuasa’s Gamera (1965). However, it is also comparatively, and crucially, impersonal. By providing their titular beasts with names, Japanese directors such as Honda and Yuasa not only made them the ‘star’ attraction, but also fully-fledged characters in their own right; this encouraging audience identification with the titular monsters even as they destroyed major cities and national landmarks. By contrast, Bong is not particularly concerned about making his monster sympathetic, and the original title is indicative of this. The international title is suggestive of the layers of meaning which can be found in The Host; it refers to an aspect of the plot – the government believe that the monster is ‘hosting’ a deadly virus – but also indicates that Bong has adopted the narrative form of the monster movie in order to discuss issues that are rupturing the social fabric of South Korea. Unusually for a ‘monster movie’, The Host reveals its beast within the first fifteen minutes, but it is this early reveal that enables Bong to focus on three interrelated themes: anti-American sentiment in South Korean society, the dissolution of the family unit, and the uncertain state of the South Korean market economy. The Host opens with an American military pathologist ordering his reluctant, but ultimately compliant, Korean assistant to pour the toxic contents of 100 bottles of formaldehyde down the drain and into the Han River. A few years later, two men fishing in the Han River discover a mutant amphibian, with one of them being bitten before releasing the creature. Four more years pass and a businessman commits suicide by jumping from a bridge and into the Han River, thereby feeding the evolving creature. 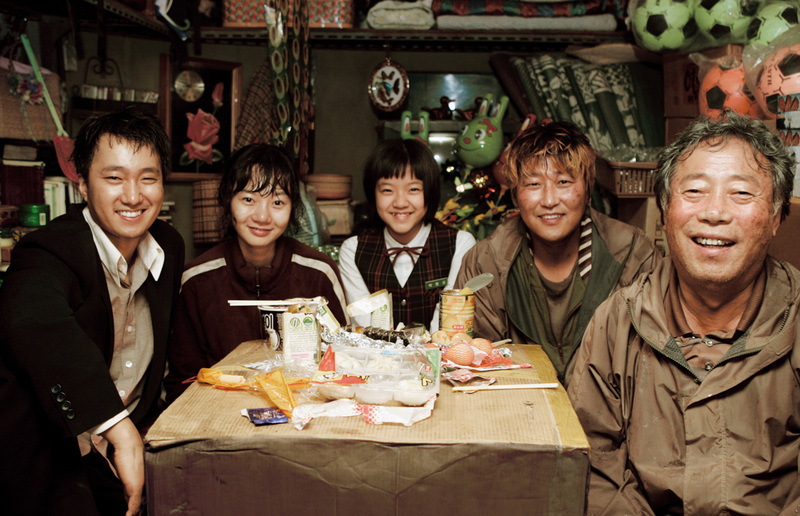 After these origin scenes, The Host settles into the present day by focusing on Park Gang-du, a slow-witted young man who runs a snack bar located near the Han River with his father, Hee-bong, while raising his daughter, Hyun-seo. Whilst serving some food, Gang-du becomes aware of the crowd that has gathered alongside the river; joining them, he witnesses the creature, now fully grown, hanging from the Wonhyo Bridge. The creature drops into the water and heads towards the shore, attacking and devouring the onlookers. Gang-du tries to flee with Hyun-seo, but she is taken by the creature and pulled into the river, ending up in the creature’s lair where she befriends Se-joo, a street urchin who is also being held captive. Gang-du and Hee-bong are mourning their lost family member at a shelter set up for victims of the attack when they are joined by two other relatives; Nam-joo is an archer who competes at national level but is undermined by a tendency to hesitate, while Nam-il is a former student-activist, now unemployed and prone to bouts of heavy drinking. Hee-bong utilises his life savings to fund a rescue attempt, obtaining a truck, weaponry and a map of the Han River sewer system. Although the set-up of The Host is familiar from other monster movies, it is actually based on a real-life incident that occurred in 2000: civilian mortician Albert McFarland of the US Army Base in central Seoul ordered his staff to dispose of 120 litres of embalming fluid by pouring the liquid down the drain. McFarland was actually tried twice for his misjudgement after the original punishment of thirty days without pay and a fine of $4,000 was considered to be insufficient by the Ministry of Justice and the Seoul District Court. The thinly-veiled McFarland substitute in The Host behaves in an unpleasant manner, belittling his Korean assistant, and the scene between the two men exemplifies the strained relationship between the United States and South Korea with regards to military presence. American scientists appear later in the film and they also have little regard for Korean society; they talk openly about the fact that there is not really a virus because they do not think that the Koreans around them understand English, and perform a lobotomy on Gang-du even though there is no reason to do so. The chemical agent they use to battle the monster in the climax is dubbed ‘Agent Yellow’, a reference to Agent Orange, the chemical agent that was used during the Vietnam War, resulting in deaths, disabilities and birth defects. The insistence that this virus exists – and the media panic which erupts because of it – has similarities to the search for Weapons of Mass Destruction in Iraq and the reaction to the SARS outbreak. However, Bong has insisted that The Host should not be read entirely as an anti-American film, and this is supported by his treatment of other political groups; the South Korean authorities are also not shown in a positive light, while Bong portrays the student protest movement as disorganised and self-righteous. The social institution of the family unit is shown to be as fractured as South Korea’s political system as the family at the heart of The Host is inherently dysfunctional; Hyun-seo’s mother has abandoned her husband and daughter, Gang-du is incompetent, struggling to take care of fundamental familial responsibilities, his brother is drowning in drink, his sister is a skilled archer but lacks confidence, and their father makes the fatal mistake of trying to shoot the creature with an empty shotgun. However, they are united by crisis and gradually come together as a unit, as emphasised by the collective mug-shot that is seen in the newspaper and on television screens. In the final scene, there is a sense that crisis and tragedy have brought about a restoration of family values, but the moment is tinged with sadness as Bong wants the audience to appreciate the cost of such change. On a winter’s night, Gang-du and Se-ju eat dinner in the food stand. The atmosphere is warm and, for the first time, proper food is being prepared as opposed to instant meals. Gang-du is now a responsible parent and is juggling this role with running the family business while also watching out for more monsters. However, while there is a sense of warmth in this scene, there is also a sense of loneliness and loss; there are pictures of Gang-du’s brother and sister on the wall, and the family mug-shot, but his brother and sister are once again absent. Although the crisis in The Host is that of a monster wrecking havoc on Seoul, the real-life crisis it refers to is the economic crash of 1997. Often referred to as the ‘IMF Crisis’ – due to the ‘bail-out’ that would be hastily arranged through the International Monetary Fund – the crisis occurred largely due to non-performing loans at Merchant Banks, a third of which were shut down by the government by January, 1998. It is this economic catastrophe which has been partially responsible for feeding the creature in The Host due to the number of people who have been committing suicide by throwing themselves into the Han River. Bong only shows one such case at the start of the film, but it would be fair to assume that the director is implying that such suicides are regular occurrences. Financial desperation and institutional corruption feature throughout The Host; police officers and medical workers expect to receive cash for helping citizens, and a ‘friend’ of Nam-il’s even tries to turn him over to the authorities in order to collect the reward money. Nam-il’s friend is one of many white collar workers who are struggling to cover living costs in a dangerously accelerated economy; after taking a look at his friend’s smart suit and nice office environment, Nam-il remarks that he must be earning ’60 or 70 thousand per year’, only for his friend to admit that his credit card debt is ’70 thousand’. The Host finds Bong collectively critiquing the problems which he believes to be undermining South Korean society via the narrative vehicle of the ‘monster movie’, thereby sharpening the satirical sensibility of his debut feature Barking Dogs Never Bite (2000) and displaying an increasingly sure-footed approach to genre. Bong utilises elements of daily South Korean life (anti-American sentiment, bribery, bureaucracy, economic hardship, media hysteria, motherless families) as plot points and punch lines, while the student demonstrations of recent history are visually referenced in the climactic confrontation with the monster. This is not so much a film about crisis, as a film about the human reaction to it, and how even the most fractured families can come together at times of emotional and physical duress. The Host is a technically superior transnational blockbuster, but it also conveys Bong’s social-political concerns, and it is the director’s merging of underlying present day tensions with thrillingly-staged fantastical panic that has endeared this particular ‘creature feature’ to a wide international audience.